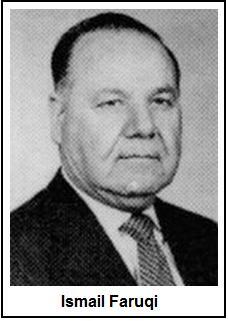 After various Muslim leaders held Jews responsible for the 1986 killing of Muslim Brotherhood leader Ismail Faruqi, a police investigation and a trial demonstrated that the murderer was an American Muslim who suspected Faruqi of having homosexual relationships with his Malaysian students at Temple University in Philadelphia. In July 1986, a Montreal Gazette reader wrote to the editor to complain that the assassination of Muslim leader Ismail Faruqi in Pennsylvania had been “deliberately left out” of the newspaper. He was particularly upset since Faruqi had been a leading figure of the Montreal Muslim community from 1958 until 1967. Clair Balfour, the Gazette’s ombudsman, rejected the claim of “anti-Muslim bias” (the term Islamophobia had not yet been invented by the Muslim Brotherhood). He concluded that the lack of coverage was understandable given the fact that Faruqi was not an international newsmaker. No major press agencies on which The Gazette relied for its information had alluded to Faruqi’s activities in Montreal, added the ombudsman. Once informed about the Montreal connection though, the Gazette’s ombudsman took the time to investigate Faruqi’s activities. On July 31, 1986, he published his findings in an article entitled Islamic Scholar Slain in U.S. Was Figure in Montreal (also scan of the original article). Al Faruqi lived in Ville St. Laurent from about 1958, when he joined McGill University’s Institute of Islamic Studies at the invitation of the institute’s founder, Wilfred Cantwell Smith of Toronto, until 1967. From 1964 to 1968 he was also an associate professor in the religion department at Syracuse University, where he met and married his wife (Lois Ibsen). Al Faruqi helped found the Islamic Centre of Montreal, in small, rented quarters on Sherbrooke St. near McGill. Today, named the Islamic Centre of Quebec and located in Ville St. Laurent, it is the province’s largest mosque. (…) In those days (Faruqi) served whisky and drank, but as he grew older he became more conservative and more religious. He once walked out of a Middle Eastern restaurant in Edmonton in protest against the staging of a belly-dancing act. (…) The couple was well enough known for an estimated 700 people to turn out for two memorial services at the Ville St. Laurent mosque, said Shafi Hosain, secretary. The Philadelphia Inquirer (May 27, 1986) mentioned that, while in Montreal, Faruqi was president of the Muslim Community of Greater Montreal (MCGM). PdeB did not find any information related to this organization. It could simply be an older designation for the Muslim Community of Quebec mentioned previously (also Canada Revenue Agency) or another name for the Islamic Centre of Montreal (ICM) founded by Ismail Faruqi. ICM is known today as the Islamic Centre of Quebec (also Canada Revenue Agency). Charles D. Fletcher has written a PhD thesis entitled Isma’il al-Faruqi (1921-1986) and Inter-Faith Dialogue: The Man, the Scholar, the Participant. It is available online through McGill University library’s catalogue. This article refers to it on a few occasions. The aim of the Islamic movement is to bring about somewhere in the world a new society wholeheartedly committed to the teachings of Islam in their totality and striving to abide by those teachings in its government, political, economic and social organizations, its relation with other states, its educational system and moral values and all other aspects of its way of life. In 2007, MSA has been described in an NYPD report as an incubator for radicalism (p. 68 – Archives PdeB). After leaving Montreal, Faruqi became a Professor of Religion at Temple University in Philadelphia where he founded and chaired the Islamic Studies program. From Temple he founded the American Islamic College in Chicago (1983) and was its first president. The Montreal Gazette article mentions that in the years immediately preceding his death, Faruqi received sums from the Middle East to support his programs of Islamic and Arabic studies. In his book Auspices of the Ultimate Victory of Islam, Youssef Qaradawi, the Muslim Brotherhood spiritual leader, explains the success of his ideology in the West by the groundwork done by the Brotherhood and the influx of petrodollars from the Middle East. While teaching at Temple, in 1981 Ismail Faruqi founded one of the most important Muslim Brotherhood organizations: the International Institute of Islamic Thought (IIIT). IIIT is headquartered in Herndon (Pennsylvania) and, today, it has satellite offices in the United Kingdom, France, Saudi Arabia, Bangladesh, Egypt, India, Indonesia, Jordan, Lebanon, Morocco, Nigeria, and Pakistan. In his book A Mosque in Munich (Boston, Houghton Mifflin Harcourt, 2010, pp. 195-196), Ian Johnson describes the 1977 Lugano (Switzerland) meeting that led to the establishment of IIIT four years later. Faruqi and Youssef Qaradawi were present. The 1977 meeting was held at the Swiss lakeside resort of Lugano … One of the most impressive (participants) was Qaradawi, who at around this time was with the magazine Al-Da’wa. Now widely known as the Brotherhood’s spiritual leader, he had been an important figure as early as the 1950’s. (…) (T)he group meeting at Lake Lugano began the arduous process of rebuilding the Brotherhood’s organization. Here in Europe, protected by laws and democratic institutions, they (the Muslim Brothers) were free to set up lasting structures. Their first was the International Institute of Islamic Thought. Despite IIIT’s name, its function was not theological. Its goal was to provide the theoretical underpinnings for the spread of Islamism in the West. It would hold conferences and allow leaders of the Brotherhood and similar groups to meet and exchange ideas. It would also publish papers and books, helping to nurture the global rise of Islamist philosophy. A year later, the group met in Saudi Arabia and decided to locate IIIT in the United States. Ismail Faruqi, a leading Islamist thinker who had also been at the Lugano meeting, was instructed to open the center in Pennsylvania, near Temple University, where he held a teaching post. The Lugano meeting was also attended by two Muslims important to the spread of the Brotherhood in the United States: Jamal Barzinji and Ahmad Totonji. When Faruqi opened IIIT in 1980, Barzinji signed the papers of registration. In the supplementary notes at the end of his Mosque in Munich (already quoted – p. 291), Ian Johnson mentions that Jaafar Sheikh Idris (Ja’far Shaikh Idris), the Islamist leader who addressed the MSA activists in 1975, was also present in Lugano in 1977 alongside Faruqi, Qaradawi and other Muslim Brotherhood leaders. Ismail Faruqi’s main theoretical contribution in furthering the Brotherhood’s agenda was his invention of a concept: the Islamization of knowledge. Conscious that they did not have the resources to challenge the West militarily at the stage they were at, the Muslim Brothers settled for an offensive that would be mostly ideological. PJ Media published an in-depth article by Laura Rubenfeld on the subject: Caught in the Act? Akbar Ahmed, the ‘Islamization of Knowledge,’ and the Muslim Brotherhood. In her article, Rubenfeld appropriately noticed that Faruqi writes about using knowledge to serve the cause of Islam, not to serve the cause of science or truth. When truth and the Islamic agenda clash, truth will always end up on the back seat. 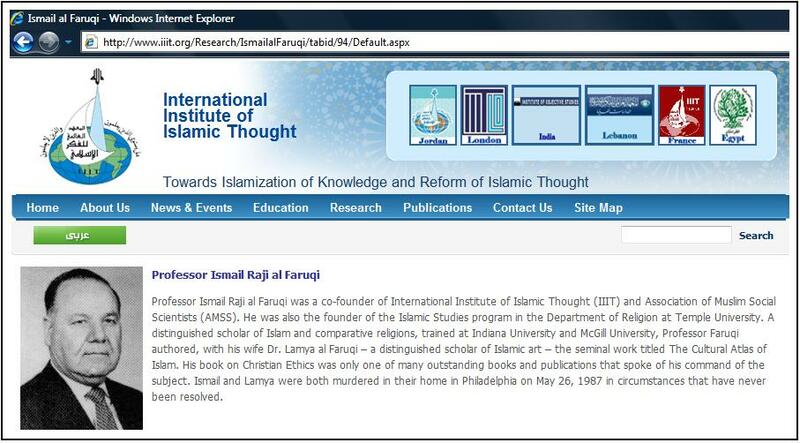 Ismail Faruqi has written many texts about interfaith dialogue and was involved in many activities with non-Muslims. In his thesis (p. 217), Charles D. Fletcher refers to a lecture given by Faruqi at the 1976 Seminar of the Islamic-Christian Dialogue in Libya. The event was organized by the World’s Islamic Call Society (WICS). The Vatican took part to the event as mentioned in Cardinal Amigo Vallejo’s biography. Fethullah Gulen’s Turkish Islamist organization also refers to the 1976 event on its website. Initially known as the Islamic Call Society, WICS was set up by Muammar Gaddafi shortly after he took power to spread Islam in non-Muslim countries. It was headquartered in what had been the Catholic cathedral downtown Tripoli until it was seized by Gaddafi’s government in 1970. WICS’ interfaith activities throughout the world became a convenient cover for Libya to transfer money towards various terrorist organizations. In a plea agreement before his 2004 conviction in the US for terrorism financing activities, Abdurahman M. Alamoudi, a Muslim Brotherhood operative and a WICS member, admitted that he transferred Libyan funds to Hamas. In 2011, Canada Revenue Agency revoked WICS-Canada’s charity status because it had transferred Libyan money to various terrorist organizations in the Americas. In the spring of 2007, IIIT offered $1.5 million to Temple University for an endowed chair in Islamic studies to honour religion professor Mahmoud Ayoub. The chair was to be named for former Temple Professor Faruqi. At the time, IIIT was being investigated by US federal agents for potential links with terrorism. Temple University insisted for the investigation to be completed before accepting IIIT’s money. On January 5, 2008, the Philadelphia Inquirer announced that IIIT withdrew its offer to Temple. The very same day, Mahmoud Ayoub was in Libya. He was on the planning committee of a WICS-sponsored interfaith meeting. At the end of the event, the participants made sure that they sent “a strong message of gratitude” to Gaddafi’s government for hosting the event. On April 5, 2010, Ayoub was designated as the representative of the Americas on WICS’ 7-person executive committee. Currently, Mahmoud Ayoub is on IIIT’s Council of Scholars with Ingrid Mattson and six others. In 1990, Youssef Qaradawi praised WICS’ interfaith activities in a lecture delivered in Algeria. (Priorities of the Islamic Movement in the Coming Phase – section The Religious Islamic-Christian Dialogue). On February 21, 2011, Qaradawi issued a fatwa encouraging Libyan soldiers to kill their own leader Muammar Gaddafi (MEMRI – JihadWatch). Muslim Brotherhood leaders asked Gaddafi for financial support almost until the very moment Qaradawi asked for his death. On February 14, 2011, the Serbian press (GMBDR) reported that Mustafa Ceric had accepted a donation from Gaddafi for the construction of a building in Sarajevo (Bosnia). Ceric is closely associated with Qaradawi through the European Council for Fatwa and Research. What motivated Faruqi to pursue interfaith dialogue was his intent to convert those with whom he was “dialoguing”. Elsewhere, Faruqi stated that those who reject “the rational truth” of the Qur’an are either “fool” or “malevolent”. Clearly, when Faruqi pleaded for “conversion to the truth”, he pleaded for conversion to Islam. Youssef Qaradawi who, alongside Faruqi, took part in the 1977 meeting that led to the establishment of IIIT, is no less clear regarding the goals pursued by his supporters who are involved in interfaith dialogue. 4.Discouraging Christian leaders from supporting fellow Christians involved in conflict with Muslims. Qaradawi specifically mentioned the case of South Sudan where Christians have been persecuted for years. On May 27, 1986, Ismail Faruqi and his American-born wife Lois were stabbed to death. The couple’s pregnant daughter was also attacked. She and the baby survived. Charles D. Fletcher mentions in his thesis (p. 30) that, at the time of the murders, the Jordanian Ministry of Islamic Affairs denounced “extremist Zionists” for having killed the Faruqis. In its July 1986 edition, the London-based magazine Arabia published an article entitled Who killed the Faruqis? It also held Jews responsible for the murders. The Toronto Star reported the item on August 17, 1986. In August 1986, the New Straits Time, a Malaysian newspaper in English language echoed what had been published in Great-Britain. The presence of many Malaysian students in Faruqi’s classroom at Temple University is probably what led the Malaysian newspaper to take an interest in these assassinations that occurred so far away. After an investigation by the local police and the FBI, Joseph Louis Young was arrested, tried and eventually convicted for the Faruqis’ murders. He was not a Jew but an American Muslim. He killed Faruqi because he suspected him of having homosexual relationships with his Malaysian students at Temple University. At the beginning of Young’s trial, the prosecutor read a confession that he made to police shortly after his arrest. The judge in the murder trial ruled that it was acceptable as evidence. In the first day of testimony in Montgomery County Court, Philadelphia Police Detective Carol Keenan read an eight-page, typewritten confession signed by Young when he was arrested Jan. 16. (…) Homosexuality is “a very degrading act for Muslims,” Young said in the confession. As MSA president, Ghulam Nabi Fai wrote the preface to Ismail Al Faruqi: An Enduring Legacy, a book written by Tariq Qureishi shortly after Faruqi’s death. After his time at the leadership of the Muslim Students’ Association (1984-1988), Ghulam Nabi Fai kept on working with other Muslim Brotherhood organizations. In 2011, GMBDR published Nabi Fai’s profile after he was arrested and found guilty of acting as an agent for the Pakistani intelligence service involved in secret lobbying efforts inside the U.S.
Khalid Duran commented about Faruqi’s assassination and his killer’s motives in the essay Homosexuality in Islam. In the past, Duran has written many articles about radical Islam. Young’s appeals for resentencing and legal technicalities were rejected in 1990 and 1993. In 1994, the U.S. Supreme Court refused to hear another appeal from Young’s (certiorari denied 511 U.S. 1012 ). The U.S. Supreme Court’s decision is mentioned in another U.S. legal case (p. 12). The Patriot-News (Harrisburg, PA) reported that, while on death row, Joseph Young died at 50 of natural causes at Greene County Memorial Hospital on February 28, 1996. In spite of the fact that Faruqi’s killer was discovered, tried and convicted and that his motive was made public 25 years ago, IIIT keeps on pretending on its website that the circumstances leading to Faruqi’s murder remain a mystery. This is clearly a case of Islamization of knowledge. They hide the truth because they figure that it would hinder their cause. The rewriting of history is a distinctive feature of all totalitarian ideologies. IIIT’s spin about the so-called “unsolved Faruqi’s murder case” is being adopted by Wikipedia and was so even by the Philadelphia Inquirer in 2008. The Inquirer is the very paper that had closely followed the investigation, the trial and the conviction of Faruqi’s murderer twenty years earlier. In 1991, five years after Faruqi’s death, a memorandum was produced by the Muslim Brotherhood in the US. It described the major steps that the network intended on following in order to Islamize the United States and Canada. 29 organizations belonging to the Brotherhood’s network were listed in the document. Faruqi’s IIIT was #28 on the list. A summary of the document is available on IPT’s website. The original memorandum (in Arabic) followed by its English translation is also available. Islamizing the knowledge led IIIT to rewrite history regarding the death of its founder. It led CAIR, another Muslim Brotherhood outfit, to doctor a photo to make it Islamicly correct. Laura Rubenfeld, a counterterrorism analyst, quoted John Adams, Benjamin Franklin, Thomas Jefferson and others to demonstrate that Ahmed’s claims were false and only served to further the Islamist agenda in the United States. The Muslim Brotherhood, the Organization of Islamic Cooperation and other participants in the currently conducted offensive of conquest in the West understood that those who contradict them constitute a major obstacle to their ambitions. Rewriting history and Islamizing knowledge was not enough for them. The Brotherhood and its allies needed to silence their critics. This is why they came up with the concept of Islamophobia. In an IPT article tackling the origins of the concept, Abdur-Rahman Muhammad, a former radical Islamist and IIIT associate, said that he was present when his then-allies coined the term Islamophobia years ago at IIIT’s offices in Northern Virginia. When the concept of Islamophobia becomes enshrined in the legislation, truth is no defence. The concept of Islamophobia leads judges to ask themselves whether or not some Muslims’ feelings are hurt and not whether or not claims made by critics of the Islamic doctrine are true.